OBJECTIVE: To investigate the changes of fibroblast growth factor (FGF)-6 expression in the regeneration and repair process after exercise-induced muscle damage (EIMD) and the relationship with skeletal muscle regeneration and repair. METHODS: The expression of FGF-6 at different time points was examined by reverse transcription-polymerase chain reaction (RT-PCR) and immunohistochemistry staining after a downhill treadmill exercise. Skeletal muscle injury and regeneration at different times after EIMD was assessed by haematoxylin and eosin (H & E) staining. RESULTS: The FGF-6 protein expression was initially elevated, followed by a gradual reduction, while the changes of FGF-6 mRNA were almost all raised after the treadmill exercise. CONCLUSION: The results point out that FGF-6 is closely related to skeletal muscle regeneration and repair, probably implying a dual function in muscle regeneration. OBJETIVO: Investigar los cambios de expresión del factor de crecimiento fibroblástico (FGF)-6 en el proceso de regeneración y reparación después de daño muscular inducido por el ejercicio (DMIE) y la relación con la reparación y regeneración del músculo esquelético. MÉTODOS: La expresión de FGF-6 en diferentes tiempos fue examinada mediante reacción en cadena de la polimerasa con transcriptasa inversa (RT-PCR) y tinción inmunohistoquímica, después de un ejercicio de carrera descendente en cinta rodante. La lesión del músculo esquelético y la regeneración en diferentes momentos después del DMIE, fueron evaluadas mediante hematoxilina y eosina (H & E). RESULTADOS: La expresión de la proteína FGF-6 fue elevada al principio, seguida por una reducción gradual, mientras que los cambios de FGF-6 mRNA fueron casi todos incrementados tras los ejercicios en la cinta rodante. CONCLUSIÓN: Nuestros resultados señalan que FGF-6 se relaciona estrechamente con la regeneración del músculo esquelético, lo que probablemente implica una función dual en la regeneración muscular. Exercise-induced muscle damage (EIMD) is a common phenomenon in unaccustomed eccentric exercise, which is embodied in impairment of neuromuscular function, reduction of motion range, increase of muscle soreness, localized limb swelling/oedema and the leakage of intramuscular proteins (1-3). These effects can last for several days after the initial bout and may negatively impact the athletes' ability to perform subsequent exercise training schedule or competitions (4, 5). Although EIMD can have detrimental shortterm effects, it has been hypothesized that a moderate amount of damage would be most appropriate for maximizing the long-term hypertrophic adaptations (4). The regeneration and repair of muscle is performed by satellite cells, which are situated between the basal lamina and sarcolemma of muscle fibres (6). Satellite cells are the quiescent stem cells in mature muscle and could be dramatically activated in response to exercise, muscle damage or degenerative muscle diseases for the sake of muscle growth, regeneration and repair (7). Once activated, they proliferate and evolve along with the myogenic lineage pathway to turn into myogenic precursor cells (Mpc), also called myoblasts (8). They eventually differentiate into fusion-competent myocytes that form multinucleated syncytia (myotubes), the immediate precursors of myofibres. Proliferation of activated satellite cells is a fundamental step of the regeneration process, serving the function of increasing the population of myoblasts and reconstituting the pool of reserve satellite cells (6). Many different growth factors may be involved in the regulation of the process such as members of the fibroblast growth factor (FGF) family, human growth factor (HGF), insulin-like growth factor (IGF1), leukaemia inhibitory factor (LIH) and others. Interestingly, FGF's activity is preferentially upregulated by eccentric exercise (4). Different members of the FGF family, comprising 10 subtypes, are present in muscle tissue and could be released after injury (9). The FGFs play a critical role in the recruitment of satellite cells to break quiescence and enter the proliferative phase (10). Among the FGF family, FGF-6 is the only member of this family showing relatively high expression which is restricted to the myogenic lineage in adult and developing skeletal muscle (11). Importantly, muscle regeneration was poor in FGF-6 gene knockout mice (12), whereas injection of FGF-6 accelerated regeneration of the soleus muscle (13). There is some lack of clarity about the changes of FGF-6 expression in regeneration and repair process after EIMD. Therefore, in the present study, we caused injury to the gastrocnemius with eccentric exercise to investigate the FGF-6 gene expression at different times after EIMD. Male Sprague-Dawley rats, two months old and weighing 264 ± 11.94 g, supplied by Shanghai SIPPR-BK Co, were acclimatized for one week in an air-conditioned room (temperature 22 ÂºC ± 2 ÂºC, relative humidity 55% ± 5% and 12-hour light/dark cycle). Drinking water and standard chow diet were supplied ad libitum. All experimental procedures were conducted in conformity with the National Institutes of Health's Guide for the Care and Use of Laboratory Animals (NIH Publications No. 80-23), revised in 1996, and approved by the Animal Ethics Committee of Shanghai University of Sport. The rats were randomly divided into a non-exercise control group and an exercise group and then sub-divided by the different times of sacrifice (n = 8 in each group). Experimental procedures of the exercise group are described in the Table. Rats in the exercise group performed a downhill treadmill (-16Âº incline) exercise at the speed of 16 m/minute for 90 minutes, according to the method described in a previous paper (14). Subsequently, the rats were placed back in their cages with free access to food and water until the time of death. At different time points after exercise, rats were anaesthetized with 10% chloral hydrate (400 mg/kg body weight) and bilateral gastrocnemius were rapidly dissected. The left was fixed in 4% paraformaldehyde for paraffin section, while the right was frozen in liquid nitrogen and stored at -70 ÂºC for later mRNA analysis. The gastrocnemius of the control animals was treated to the same process. After 24 hours of fixation, the specimen was then washed thoroughly with tap water and trimmed to suitable size, in the correct orientation, using a band saw. Thereafter, the specimen was dehydrated through a graded alcohol series and infiltrated with paraffin. Serial sections were taken at 5 µm. For histological analysis, haematoxylin and eosin (H & E) stainings were processed by standard procedures (15). For immunohistochemistry, sections were stained with a rabbit polyclonal antibody against FGF-6 (purchased from Santa Cruz Biotechnology Inc, Santa Cruz, CA, USA). Five sections were randomly selected from each group and five areas were randomly captured by Olympus DX70. Subsequently, integrated optical density (IOD) was analysed by Image-Pro Plus 4.1 software. Total RNA was extracted using the TRIzol reagent (Invitro-gen) according to the manufacturer's instructions. The RNA concentration was determined spectrophotometrically at 260 nm and the quality of RNA was checked spectrophotome-trically by using the ratio of absorbances at 260/280 nm. After extraction, the total RNA (2 µg) was used to synthesize first-strand cDNA and the cDNA product (200 ng) was amplified by polymerase chain reaction (PCR) Express Thermal Cycler (Bio-Rad) using the following primers: GAPDH (forward) 5' - ACC ACA GTC CAT GCC ATC AC -3', GAPDH (reverse), 5'- TCC ACC ACC CTG TTG CTG TA -3', FGF-6 (forward), 5'- CAT TAA GCG ACA GCG GAG ACT -3', FGF-6 (reverse), 5'- CGT CCA TAT TTG CTC AGT GCA -3'. The amplified PCR products were separated by 1.2% agarose gel electrophoresis, and the product was finally visualized with an image analyser (Bio-Rad Gel-Doc, 2000). The GAPDH mRNA was used as an internal control and the expression of FGF-6 was normalized to respective GAPDH. All results were expressed as means and standard errors. Differences among means were assessed by one-way analysis of variance (ANOVA) followed by Student-Newman-Keuls post hoc test. Significance level was set at p < 0.05. All calculations were performed using the SPSS 17.0 software. Haematoxylin and eosin staining on the serial cross-sections of paraffin blocks of muscles from the non-exercise group displayed cell polygon, normal size, sarcolemma integrated and no inflammatory reaction in muscle interstitium (Fig. 1A). Six hours after exercise, some cells swelled and appeared round (Fig. 1B). Seventy-two hours after exercise, swelling of cells was gradually increased and aggregations of mononuclear cells were observed in the muscle interstitium and some muscle fibres (Fig. 1F). Inflammatory cell infiltration almost disappeared (Fig. 1G) and the structure of muscle fibres generally recovered normally two weeks post exercise (Fig. 1H). As shown in Fig. 2A, the expression of FGF-6 was visualized by immunohistochemistry staining. The statistical comparison revealed that the IODs of FGF-6 were significantly elevated at the 6th and 12th hour after downhill treadmill exercise, almost close to twice the control 12-hour group (p < 0.05, Fig. 2B). Twenty-four hours after exercise, the IODs displayed a downtrend. In the 48-hour, 72-hour, one-week and two-week groups, the IODs were obviously decreased (p < 0.05; Fig. 2B). 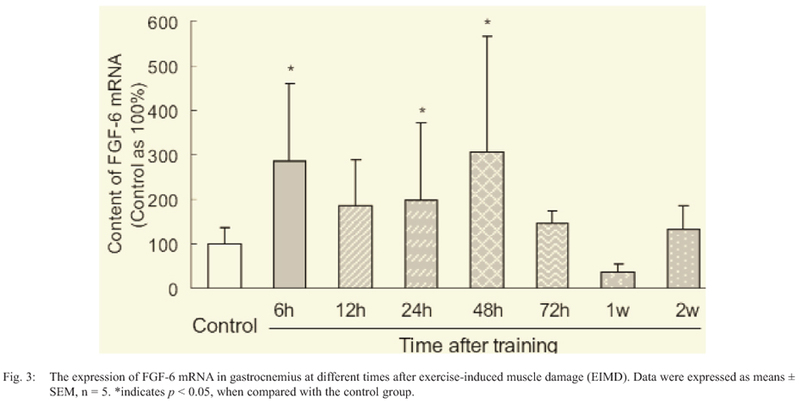 Different from the changes of FGF-6 protein, the levels of FGF-6 mRNA were obviously increased at various time points after exercise, except for one week after exercise (Fig. 3). At the 6th and 48th hour after exercise, the levels of FGF-6 mRNA were markedly elevated, up to three times the control group (p < 0.05; Fig. 3). As can be seen in Fig. 3, there was also a significant difference between the 24-hour group and the control group. However, the levels of FGF-6 mRNA did not significantly rise in the 12-hour, 72-hour and two-week groups. We were interested in the gastrocnemius because this muscle could provide the driving force for many daily and sports activities, eg walking, running and jumping. Therefore, in the present study, we damaged the gastrocnemius with downhill treadmill exercise, an unaccustomed eccentric exercise followed by muscle damage (16). The morphological alterations of the muscle fibres after exercise reflected by histological observation displayed the approximate process of muscle injury and recovery (Fig. 1). At different time periods after exercise, we investigated the gene and protein changes of FGF-6. Interestingly, the tendency of change of FGF-6 mRNA disaccorded with that of FGF-6 protein. The changes of FGF-6 protein looked like a parabola, ie initial elevation following reduction, while the changes of FGF-6 mRNA were always raised except for the group of seven days. There was some disparity with a previous report. Armand et al (13) reported the endogenous FGF-6 protein in soleus regenerating muscle peaked at 72 to 84 hours after injection of cardiotoxin, a single injection which caused an almost complete degeneration of the myofibres within 24 hours. The disparity may be due to the different kinds and extent of muscle injury. Activated satellite cells express several myogenic markers, such as MyoD. Our previous study suggested that the number of MyoD positive nuclei was significantly increased 24 hours after downhill running, and reached peak level after 48 hours (17). A number of studies have reported the relations between specific FGFs and satellite cell activation during muscle regeneration and hypertrophy (18). Three days after freeze-crush injury, FGF-6 as well as myogenic transcription factor MyoD mRNAs were concomitantly up-regulated with the regeneration of skeletal muscle (12). Fibroblast growth factor-6 mRNA levels were significantly increased 72 hours after synergist ablation in the plantaris muscles, while MyoD mRNA levels started to increase 48 hours after synergist ablation (18). While FGF-6 mRNA levels did not change after bupivacaine administration in the plantaris muscles, MyoD mRNA started to increase 24 hours after bupivacaine administration (18). The increase of FGF-6 mRNA was very small and the expression pattern of FGF-6 mRNA did not overlap with MyoD and other myogenic or cell cycle markers. Tanaka et al (18) presumed that FGF-6 was unlikely to relate to satellite cell activation during muscle regeneration and hypertrophy. The analyses of Fgf6 (-/-) mutant mice also gave contradictory results. In Fgf6 (-/-) mutant mice, the number of MyoD-expressing activated satellite cells was significantly reduced after injury, presumably due to a lack of activation or proliferation of quiescent satellite cells (12). In contrast, Fiore et al (19) reported that skeletal muscle regeneration is not impaired in Fgf6 (-/-) mutant mice after notexin injection or crush injury. Different hypotheses had been suggested to explain the differences observed between the two mutant mice lacking FGF-6, including compensation of FGF gene expression in different genetic backgrounds (20), the different design of the targeted mutation (21) and stochastic variations (22), even in a uniform genetic background. Recent reports suggested that FGF-6 had a biphasic effect on muscle regeneration, stimulating myoblast proliferation/migration and muscle differentiation/hypertrophy in a dose-dependent manner (13, 23). The dual role of FGF-6 in myogenesis would be the result of a balance of its action on the two receptors FGFR1 and FGFR4 (23, 24). In the present study, the expression of FGF-6 protein after EIMD was gradually increased up to a peak and subsequently reduced. Further study should be performed to clarify whether the expression pattern of FGF-6 protein after EIMD is related to the dual role of FGF-6 in myogenesis. This work was supported by research grants from the National Natural Science Foundation of China (No. 31171139). 1. Howatson G, Hough P, Pattison J, Hill JA, Blagrove R, Glaister M et al. Trekking poles reduce exercise-induced muscle injury during mountain walking. Med Sci Sports Exerc 2011; 43: 140-5. 2. Howatson G, van Someren KA. The prevention and treatment of exercise-induced muscle damage. Sports Med 2008; 38: 483-503. 3. Paschalis V, Nikolaidis MG, Giakas G, Jamurtas AZ, Pappas A, Koutedakis Y. The effect of eccentric exercise on position sense and joint reaction angle of the lower limbs. Muscle Nerve 2007; 35: 496-503. 4. Schoenfeld BJ. Does exercise-induced muscle damage play a role in skeletal muscle hypertrophy? J Strength Cond Res 2012; 26: 1441-53. 5. Krentz JR, Farthing JP. Neural and morphological changes in response to a 20-day intense eccentric training protocol. Eur J Appl Physiol 2010; 110: 333-40. 6. Buckingham M. Myogenic progenitor cells and skeletal myogenesis in vertebrates. Curr Opin Genet Dev 2006; 16: 525-32. 7. Charge SB, Rudnicki MA. Cellular and molecular regulation of muscle regeneration. Physiol Rev 2004; 84: 209-38. 8. Hawke TJ, Garry DJ. Myogenic satellite cells: physiology to molecular biology. J Appl Physiol 2001; 91: 534-51. 9. Johnson SE, Allen RE. Activation of skeletal muscle satellite cells and the role of fibroblast growth factor receptors. Exp Cell Res 1995; 219: 449-53. 10. Yablonka-Reuveni Z, Seger R, Rivera AJ. Fibroblast growth factor promotes recruitment of skeletal muscle satellite cells in young and old rats. J Histochem Cytochem 1999; 47: 23-42. 11. deLapeyriere O, Ollendorff V, Planche J, Ott MO, Pizette S, Coulier F et al. Expression of the Fgf6 gene is restricted to developing skeletal muscle in the mouse embryo. Development 1993; 118: 601-11. 12. Floss T, Arnold HH, Braun T. A role for FGF-6 in skeletal muscle regeneration. Genes Dev 1997; 11: 2040-51. 13. Armand AS, Launay T, Pariset C, Della Gaspera B, Charbonnier F, Chanoine C. Injection of FGF6 accelerates regeneration of the soleus muscle in adult mice. Biochim Biophys Acta 2003; 1642: 97-105. 14. Armstrong RB, Laughlin MH. Blood flows within and among rat muscles as a function of time during high speed treadmill exercise. J Physiol 1983; 344: 189-208. 15. Bancroft JD, Stevens A, eds. Theory and practice of histological techniques. Edinburgh: Churchill Livingston; 1990. 16. Byrne C, Twist C, Eston R. Neuromuscular function after exercise-induced muscle damage: theoretical and applied implications. Sports Med 2004; 34: 49-69. 17. Chen N, Yu X. The changes of MyoD in gastrocnemius of SD rat at different time points after downhill treadmill. Chin J Appl Physiol 2010; 43: 420-2. 18. Tanaka Y, Yamaguchi A, Fujikawa T, Sakuma K, Morita I, Ishii K. Expression of mRNA for specific fibroblast growth factors associates with that of the myogenic markers MyoD and proliferating cell nuclear antigen in regenerating and overloaded rat plantaris muscle. Acta Physiol (Oxf) 2008; 194: 149-59. 19. Fiore F, Sebille A, Birnbaum D. Skeletal muscle regeneration is not impaired in Fgf6 -/- mutant mice. Biochem Biophys Res Commun 2000; 272: 138-43. 20. Doetschman T. Interpretation of phenotype in genetically engineered mice. Lab Anim Sci 1999; 49: 137-43. 21. Valenti P, Cozzio A, Nishida N, Wolfer DP, Sakaguchi S, Lipp HP Similar target, different effects: late-onset ataxia and spatial learning in prion protein-deficient mouse lines. Neurogenetics 2001; 3: 173-84. 22. Mansour SL, Goddard JM, Capecchi MR. Mice homozygous for a targeted disruption of the proto-oncogene int-2 have developmental defects in the tail and inner ear. Development 1993; 117: 13-28. 23. Pizette S, Coulier F, Birnbaum D, DeLapeyriere O. FGF6 modulates the expression of fibroblast growth factor receptors and myogenic genes in muscle cells. Exp Cell Res 1996; 224: 143-51. 24. Armand AS, Laziz I, Chanoine C. FGF6 in myogenesis. Biochim Biophys Acta 2006; 1763: 773-8.